ABSTRACTION TWENTYEIGHTEEN is an initiative showcasing Abstract and Non-Objective art: one exhibition, over one hundred artists, hosted by five Melbourne exhibition spaces. Each venue has selected works that demonstrate its particular curatorial practice and aesthetic, with artists from around Australia working in various in materials and formats. Such diversity reflects the range of contemporary artistic interest in Abstract and Non-Objective art. Practitioners with decades of experience and recent graduates celebrating its innovative vitality, its freshness and longevity. In 1968, the National Gallery of Victoria – St Kilda Road, opened. A major architectural and cultural emblem, highlighting the maturity and strength of the Victorian and Australian burgeoning artistic ambition. The Field, an exhibition of Abstract art that affirmed the aspirations of Australian art in an international context, was significant to the opening of this new cultural institution. The built form of the NGV is ‘modernist sombre’ and restrained, while The Field was exuberant, high energy and excessive in presentation–a magnificent balance. In 2018, the NGV celebrates 50 years in St Kilda Road with The Field Revisited. It is more than a restaging of the breakout exhibition; it is a retelling of a great moment in a long story. ABSTRACTION TWENTYEIGHTEEN is complementarity with The Field Revisited and its precursor. The works in the exhibition reflect on a deeper history than just post/modern moments and sensibilities. The show reveals influences and derivations, progressions and grand re-examinations of artistic cul-de-sacs. All manner of aesthetic polemics and political postures are reified and re-contextualized to make and mark works that advance the action beyond novelty of the new. 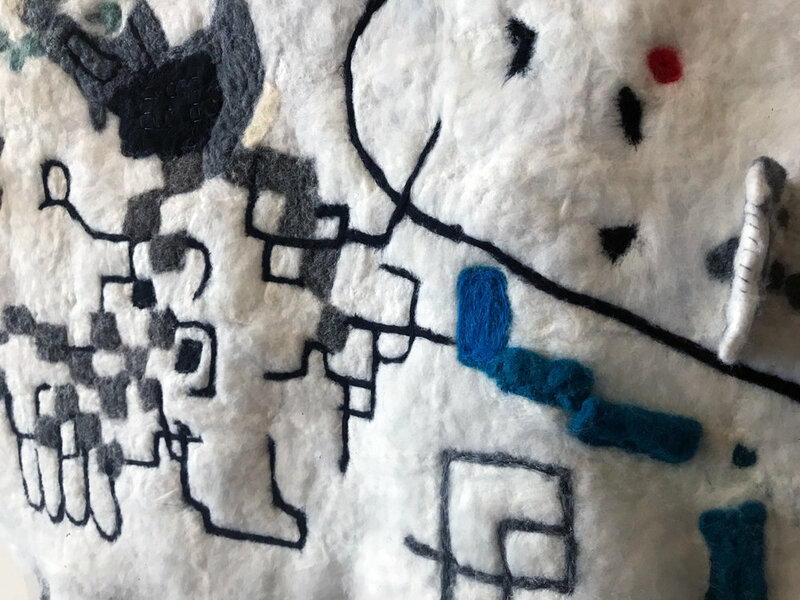 Tina Douglas fuzzy logic 2018, hand felted wool, stainless steel fibre, micro controllers, speakers, sound, painted ply, 91 x 91 cm, detail.